Eleven of my teammates advanced to the gold medal round today with semifinal wins. 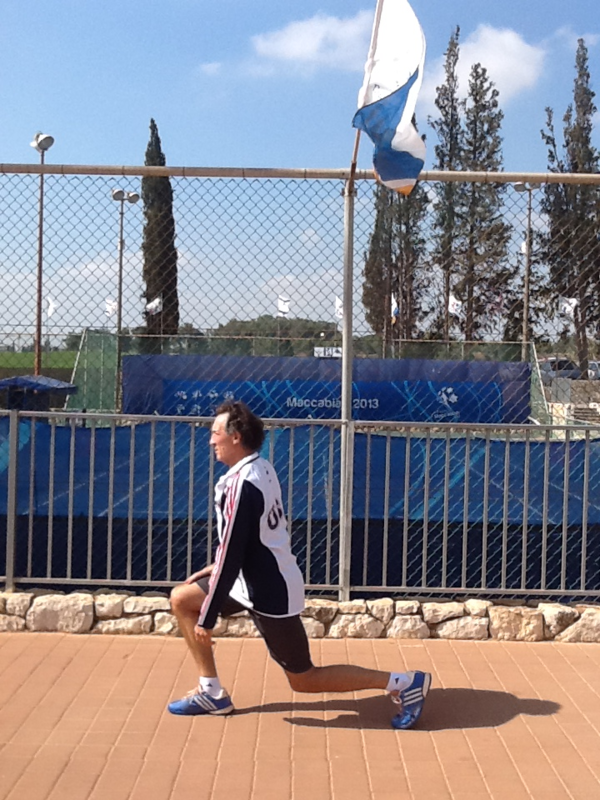 We started with twenty three players on our teams and fifteen of them will leave Israel with medals and memories of a lifetime. How many people can, in one week, march in front of 40,000 people, compete for the USA and get a bronze, silver or gold medal. It is a small number. I have come to love many of these guys as we have worked on this over the last year. We are bonded forever and I am a better person for it. For me, each medal feels like personal gold. I am so fortunate to have had the opportunity to coach these guys. 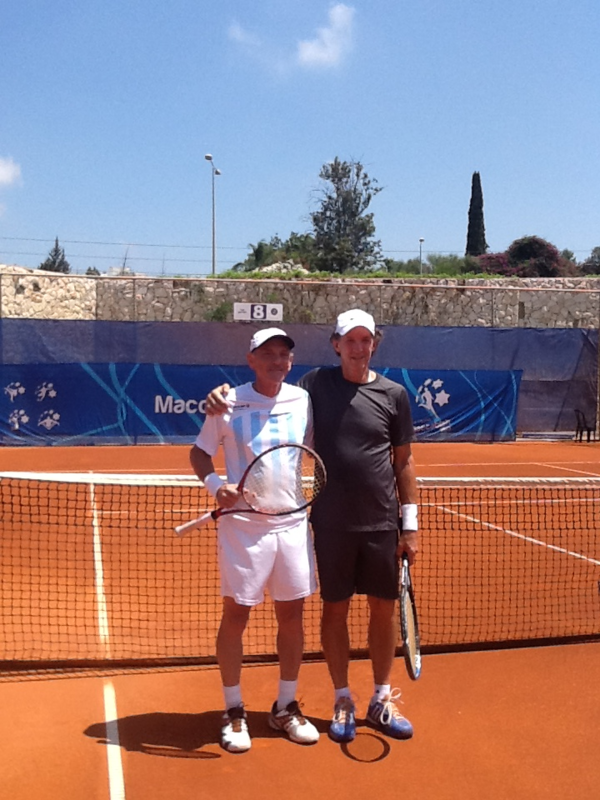 Before my match I met Harel Levy, a long time Israeli Davis Cup star. 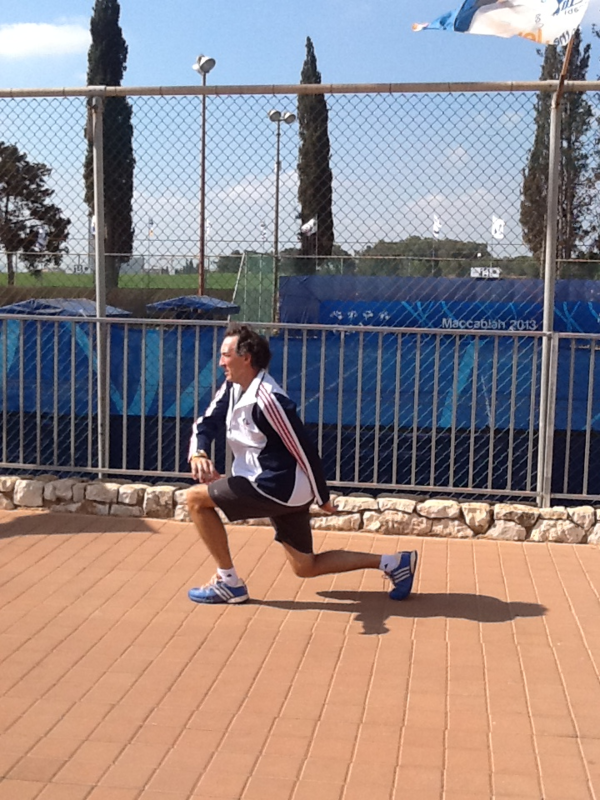 He is now the High Performance Coach for the Israeli junior players. We talked about me returning to Israel to help the young kids who are in this amazing program where they first develop the persona and then the tennis player. What a great foundation. I was scheduled for 9:30 but the matches were running very late. It was tougher than usual to be patient but I managed to stay focused on my dynamic exercises, a little meditation and hanging with my teammates. I didnt start until 11:45. Hot. Hot. Hot. My semifinal went smoothly as I defeated Argentinian Ricardo Neuberger. I played a clean match, once again keeping errors to a minimum. I played each point as I had planned, with the feeling that it would be the only point I would ever play.The first set was a breeze as Ricardo discovered early that he had to go big to impact. I was running well and playing within myself. This makes me a tough opponent to win a point against. I won the first set 6-0 never taking my foot off the accelerator. I enjoyed the Davis Cup atmosphere as eight Argentinians were cheering loudly on every point Ricardo won. I appreciated the support they had for their warrior. Ricardo was a great guy and fierce competitor. He almost got his teeth into the match in the second set as he won two or the first three games in the second set. I just got tougher, and from 1-2 ran out the set to win it 6-2. Felt really good, especially how I kept my head down the entire match. My focus got a 10 rating. I loved that Ricardo never quit and I have big respect for him as a player. These moments in my life are so special. Sharing them with Jo Ann makes them moreso. She takes great care of me, coaching me off the court by reminding me to drink water and to keep bending my knees. Tomorrow, there is no match because it is shabbat. 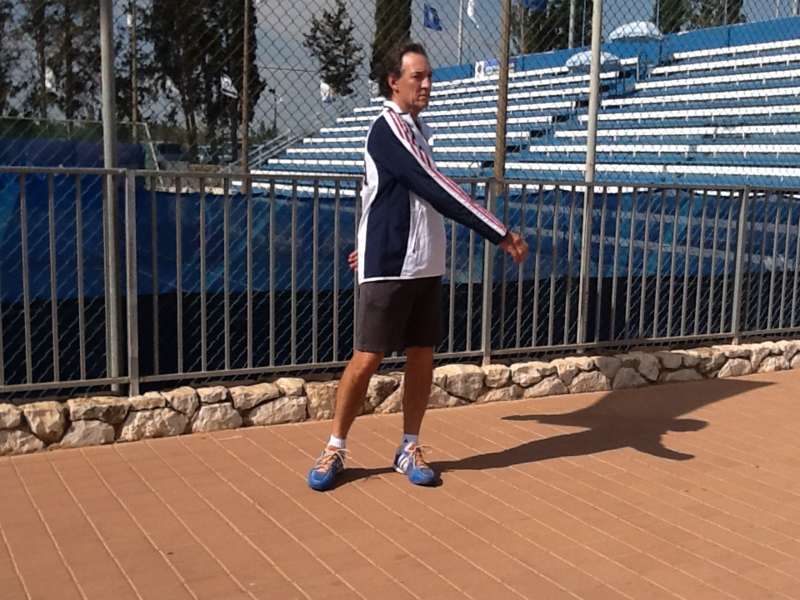 We will be going to the Jaffa Israeli Tennis Center to play a fun round robin with players from the other countries. Sunday will be the gold medal match day. As always love your blog and posts. And glad to see pics. And to see Jo Ann. Go win it. Best of luck tomorrow. Win, lose or draw you are a hero to Jo Ann and all the players on your team…Look forward to seeing you back in Long Island…. Good luck Bob! Great insights- really enjoy and benefit from reading your blog. The best of luck to you Sunday. Keep that focus. As always, thanks for sharing your vivid writing. Go get ’em. Waiting to see that picture of you on the winners’ stand with the gold around your neck! Congratulations Bob, you are a great player, it was a pleasure to play against you.